Dental bridges can provide a fast and non-removable solution to replacing missing. Just as the name implies, a “bridge” of connected crowns are attached on nearby teeth to give the appearance/function like your normal teeth. Dental implants are the gold standard for replacing teeth, as they can provide excellent function and aesthetics, depending on the case. Additionally, they do not require adjusting nearby teeth like dental bridges. Whether you are missing a few teeth or all your teeth, dentures can provide a cost effective solution to replacing missing teeth. However, patient satisfaction is the lowest as they are removable appliances and do not provide as much function as the other solutions. In cases of substantial tooth loss due to tooth decay, gum disease, or trauma, dentures may be the best solution. 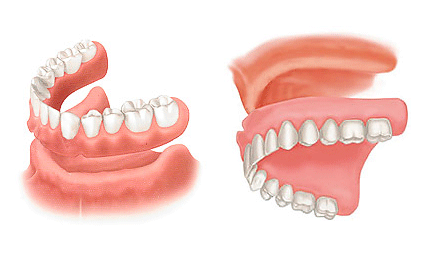 A denture is a piece that contains prosthetic teeth and fits into your mouth to replace the missing natural teeth. A full denture consists of a gum-colored artificial base that holds the prosthetic teeth and fits over the gums on the bottom, with the top denture covering the palate. Full dentures are necessary when all the teeth need to be replaced. A partial denture, which is used when some but not all of the teeth are missing, is built onto a metal frame that attaches to your natural teeth. Dentures are custom-made from impressions of your mouth to closely resemble your natural teeth. While they may take some time to get used to, you’ll enjoy a number of benefits from your dentures. Not only will they make your smile look better, they also fill out your overall facial appearance. When you’re not wearing them, you should store your dentures in a special solution or just plain water so that they don’t dry out. Your dentures will need to be adjusted and even remade over time, but following good dental hygiene practices will help you get years of smiling satisfaction from them!